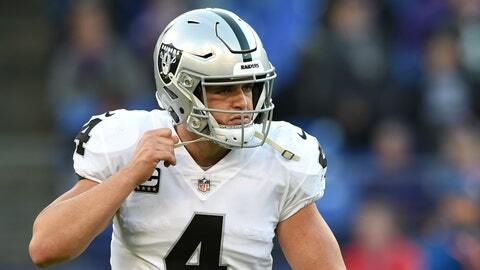 ALAMEDA, Calif. (AP) — Oakland Raiders quarterback Derek Carr feels much more relaxed in Jon Gruden’s offense than he did at the beginning of the year. It’s too late to salvage the Raiders’ season but for a team that is 2-9 and in the hunt for the No. 1 overall pick next year, baby steps are important. For Carr, whose future as the team’s franchise quarterback is no longer a certainty, it is even more critical. That’s a significant turnaround after Carr was picked off eight times in the first five games, making him an easy lightning rod for criticism from media and fans and, at times, from Gruden. Carr’s last interception came Oct. 7 when San Diego defensive end Melvin Ingram picked him off in the end zone on a 1st-and-goal play from the 1. Carr’s interceptions early in the year were part of a problematic offense that has been among the NFL’s least effective for most of the season. The Raiders are 24th in overall offense and 18th in passing heading into Sunday’s game against the Kansas City Chiefs.